I’m a little behind on sharing my last two designs for Fandom In Stitches’s Summer of Stitching! Be sure to stop by next week for the final installment: I ❤ Disney! C3P0 was always my favorite Star Wars character. I love how pessimistic he is and how much he depends on R2D2 without even realizing it. When it came time to design a Star Wars block, he was the first thing that popped in my mind. I’m a bit behind on Game of Thrones, having only read the books once and only watching the first season of the show. My daughter is currently working her way through the books and as she and I both agree that dragons are one of the best parts of any fantasy novel, I designed this block for her! Get the free pattern for both designs by clicking on the name under the photo. Looking for all my fandom patterns? You can find them on the Free Fandom Patterns and under Free Harry Potter Patterns! 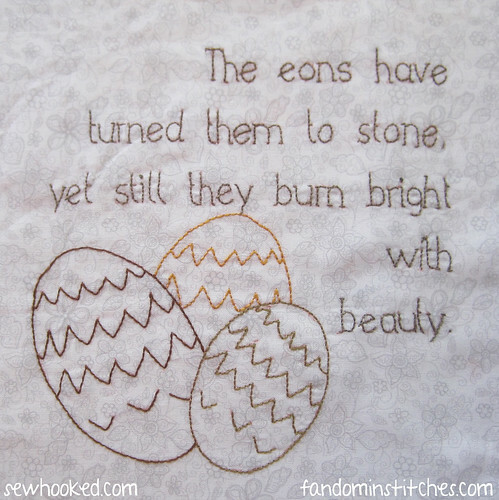 Visit Fandom in Stitches by even more free designs by a plethora of designers! This month, ALL photos of projects made from Sewhooked patterns, including Paper Piecing Vintage, shared with the Sewhooked flickr group will be entered to win a copy of Jack Leaves The Light On! Winner announced next week! 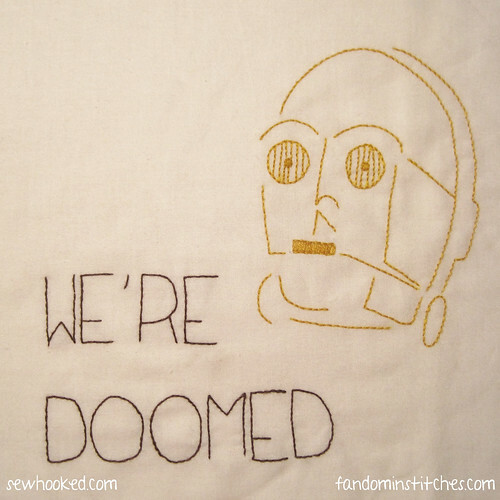 This entry was posted in embroidery, Fandom In Stitches, Fandoms and tagged c3p0, dragon eggs, embroidery, fandom in stitches, game of thrones, hand embroidery, sos2014, star wars, summer of stitching on August 28, 2014 by Jennifer Ofenstein.